West Valley, AZ- Benevilla has been awarded a $25,000 Bank of America grant to assist our mission of keeping seniors independent in their own homes as long as possible. Bank of America grants focus on removing barriers to economic stability such as hunger, shelter and other basic needs. Benevilla actively works to strengthen West Valley communities by providing services addressing the day-to-day physical, emotional and social needs of the elderly, children and disabled populations. 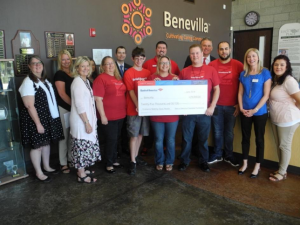 Funding from the grant will support the Benevilla Home Services program and the Benevilla C.A.R.E.S. Program keeping older adults and adults with disabilities independent in their homes. The Benevilla Home Services program provides older adults in our community that little extra assistance to maintain their independence by providing help with grocery shopping, assisted transportation to medical appointments, light handyman services, and friendly visits, all provided by Benevilla volunteers. The Benevilla C.A.R.E.S. program is a free community resource available by phone or in person to answer a variety of questions like, how to find a ride to the doctor or how to find a reputable home care company. Benevilla C.A.R.E.S. also offers a variety of free Caregiver Support Groups to our neighbors in need. Bank of America’s commitment to corporate social responsibility (CSR) is a strategic part of doing business globally. Our CSR efforts guide how we operate in a socially, economically, financially and environmentally responsible way across more than 100 markets around the world, to deliver for shareholders, customers, clients and employees. Our goal is to help create economically vibrant regions and communities through lending, investing and giving. By partnering with our stakeholders, we create shared value that empowers individuals and communities to thrive and contributes to the long-term success of our business. We have several core areas of focus for our CSR, including responsible business practices; environmental sustainability; strengthening local communities with a focus on housing, hunger and jobs and volunteerism; investing in global leadership development; and engaging through arts and culture. Learn more at www.bankofamerica.com/opportunity.